We all blasted through the front door a few hours ago, feet dirty and a bit exhausted from a full day of blueberry picking -- something that's become a bit of a family tradition in late July ever since Oliver was born. We have photos out in the field with O in the baby carrier, chubby legs swaying in the breeze while I obsessively applied sunscreen every ten minutes. Last year found Oliver and his friend Lewis traipsing through the rows of berries together in the late morning hours, eating more than we ended up taking home. This year's photos tell a different story: Oliver and I in a big open field used for overflow parking, he sitting on his little potty, me singing songs and chatting away, the sun beating down on the two of us. We're deep in the thick of potty training, so as it turned out, Sam and Oliver's Aunt Christa did the brunt of the picking today. But Oliver and I had some good talks while staying hydrated, people watching, and eating Sour Cream and Onion Kettle chips. Not a bad way to spend a morning. And really, it's never about how many berries we bring home because neither of these years have proven to be particularly bountiful, but it just never feels like high summer until we get out there and start filling our buckets, however slowly. I've been spending some time organizing photos lately, trying to actually print a few to frame for the house, and purge others from my phone. We took so many while in Hawaii: great ones of epic beaches and outdoor picnics, moments that you'd expect would feel important and memorable. But in thinking back, it's neither of these things that stand out for me. Instead, the night I'll remember most is when we pulled up to a beachside restaurant we'd been excited to try for dinner and were told that the wait was 60-80 minutes. With a toddler that's basically a lifetime, so my immediate reaction was a firm No. But Sam pointed to this big grassy field right next to the beach with lawn games and string lights, and in his never-failing positivity, promised the time would fly by. Late the other night we arrived home from a week-long stay on the big island of Hawaii. Oliver promptly fell asleep in the car ride home (of course, after not sleeping through the duration of our 12 hour travel day), and Sam and I were starving so we stopped at the store for a frozen pizza, got O into bed and brought the luggage upstairs, and sat quietly at the dining room table listening to the spring rain sharing a few slices. It wasn't great pizza, and it followed not great airport sandwiches, and all I could think about was how excited I was to get in the kitchen and make something great. 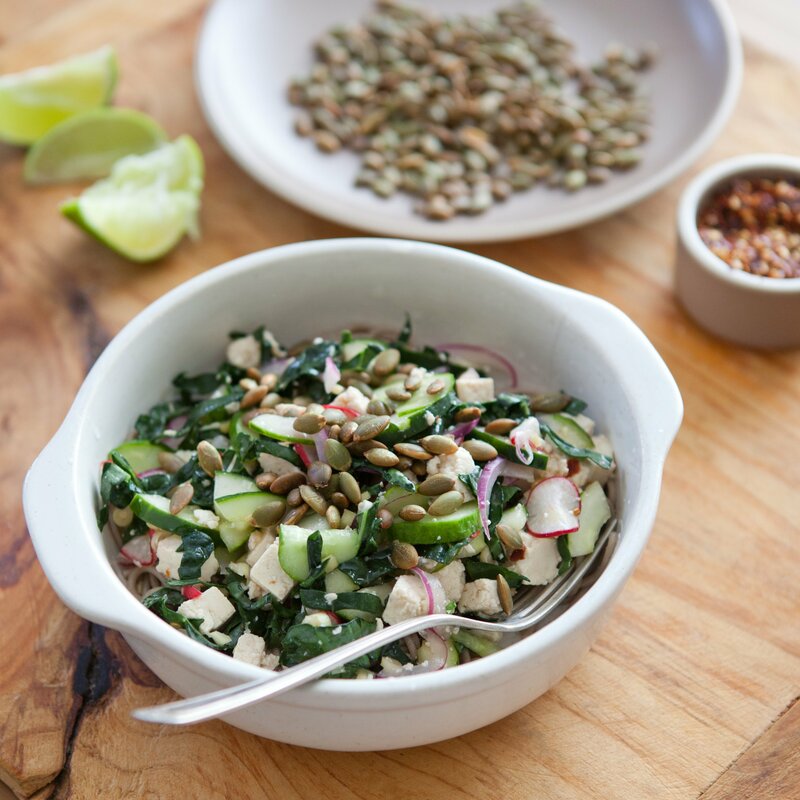 Something with protein that felt nourishing and tasty -- that all of us would eat and love. So instead of tackling the piles of vacation laundry today (so. much. ketchup), I headed to the store to pick up a few things to make a springtime chickpea salad -- great as a sandwich filling or dip, and the perfect antidote to too much starchy food on the road. I first realized spring was truly here the moment I stepped on an airplane with Oliver a few weeks ago headed to see my mom in Vermont. Some of you may know that it's decidedly not spring in Vermont. But in Seattle we'd had a good sunny stretch and our daffodils were in full bloom; Sam mowed the lawn for the first time in months and the smell of fresh cut grass greeted us each time we walked down to the garage to get into the car. The season is slowly yet surely changing. I've had this recipe in the hopper for a few weeks, thinking I'd stagger it out and share it with you in a bit as we're traveling to see family back East. But yesterday on the drive back from the Adirondacks to my mom's house in Vermont, we saw a handful of crimson leaves and signs for cider donuts and I thought: Now Is The Time. I hope you still have some fresh corn where you are and some late summer berries because this incredibly simple late summer fruit crisp is the best thing I've baked this season. Let's talk about it. In a few short weeks, we're headed to New York, Vermont and New Jersey to visit family and see my sister Zoe get married. In starting to think through the trip and do a little planning, I found Oliver the cutest tiny-person dress shoes I've ever seen (and he's quite smitten with them), sussed out childcare options for the night of the wedding, and found what feels like the most expensive (and last) rental car in the state of New Jersey. I try very hard not to be one of Those People that begins lamenting the loss of a season before it's remotely appropriate to do so, but this year, as we'll be gone much of September, I've felt a bit of a 'hurry, make all the summery things!' feeling set in. So we've been managing increasingly busy days punctuated with zucchini noodle salads, gazpacho, corn on the cob and homemade popsicles (preferably eaten shirtless outside followed by a good, solid sprinkler run for one small person in particular. Not naming any names). The last time we were camping on Orcas Island, I was almost 7 months pregnant and we shared a shaded campsite with two other couples and their kids. I made banana bread and recall hoarding it from the kids (and, really, everyone); Sam and I snuck into town for strong lattes early in the mornings, spent a lot of time down by the lake and on easy ambling hikes, and took turns cooking over the fire each night for dinner. As is so often the case with camping, the days felt eternally long in that loose, listless way that only summer can gift us, and we came home with flip-flop tan lines and dusty hair. I've been in the slow process of cleaning out my home office this week, and yesterday I stumbled upon some notebooks containing previous year's Summer Bucket Lists (if you may recall, I used to write sort of elaborate lists of things I wanted to learn, see or accomplish during the summer season). Scrawled throughout these pages were lines about baking sourdough bread, starting a garden for cut flowers or taking a road trip and discovering new towns in the region (or beyond). This year I don't have such a list. The days feel more like a race to get our work done, figure out how to feed ourselves, take care of the plants in the backyard, be a good friend, be a good sister, be a good mom and a good partner. Walk to the park. Point out airplanes, trucks, buses, vans, birds and flowers with Oliver. Drink a cocktail and watch The Handmaid's Tale with Sam at night. Buy wedding presents and shower presents. Show up. I sat down to write this Mother's Day post a few weeks ago, and was so looking forward to sharing these strawberry muffins with you. I'd planned to write a simple enough post on motherhood, a dispatch of sorts, 18 months in. But as the days ticked on and I stared at my screen, I found myself constantly hedging and apologizing and acknowledging how hard this thing is for so many: to get pregnant, to stay pregnant, to find a community as a new mom, to continue feeling like yourself, or some semblance of the self you remember, to be the kind of mom you always thought you'd be, to be ok -- periodically -- with letting the kind of mom you'd always wanted to be ... go. So today I'm sharing a bit of a messier glimpse into things over here and please know that you have my full permission to just scroll down to the bottom of this post if you just want to make yourself some damn muffins and get on with your weekend. I get it. They're good muffins. Last week, we took a quick trip to Lake Tahoe to celebrate my sister Zoe's birthday and the last hurrah of summer. My family has a cabin on the lake that we've had since I was a little girl, and it felt like a pretty big deal showing Sam and Oliver around the little town -- where we got ice cream as kids, the mini golf course, the modest town beach and run-down motel that's been there for ages. We got burgers at The Char Pit, Oliver went on his first boat ride and his first hike, and we saw some crazy-pink California sunsets. When we got back to Seattle it felt surprisingly like fall: somehow in the span of just a few days, we've got leaves on the ground and cooler mornings and evenings. I promptly packed away my swimsuits, got out my sweaters, and made a run to the farmers market to load up on summer produce while we still can: tomatoes, eggplant, peaches. Oliver's been eating the peaches for breakfast in yogurt or cottage cheese and I had plans to make ratatouille with the eggplant and tomatoes, but then I thought maybe I should try something a bit out of my comfort zone. So I got out a big pot, and set out to fry up some eggplant fries. A few weeks ago we had our parent's group over to the house for a barbecue and potluck in the backyard. We all have babies around the same age and they all go to bed around 7 pm which, frankly, makes for a very early barbecue, so we met in the late afternoon; Sam and I picked up sausages, beer and all the fixings and asked everyone else to bring a dish to share. The following day I started cooking from Kristin Donnelly's new book, The Modern Potluck, and wished I'd started sooner as this corn salad would've been perfect to share: it's got late summer, sweet August corn, effortless cooking written all over it. It's smoky and a little bit creamy with a splash of lime and nice pops of color from the radishes and cilantro. Apparently Kristin was inspired here by the Mexican street snack elote, corn on the cob slathered with mayonnaise and cheese. And while I have to admit that I've never tried elote, if it's anything like this salad, I'm 100% on board. Two Saturdays ago, we hopped in the car and drove up to Bow, WA to pick blueberries. I envisioned coming home with a huge bucket and having that wonderful seasonal quandary: what to do with all of these berries?! Instead, we came home with a pound and a half: It turns out that picking berries in the hot August sun with an active baby is a slow endeavor -- and it's possible I kept snacking on our loot. When we got home (after blueberry ice cream sandwiches and a stop at the OshKosh B'Gosh outlet for some baby suspenders) I knew exactly what we'd do with our "haul:" fresh blueberry ice cream. And hopefully, if we had a few leftover, pancakes the next morning. When you have an eight month old baby, making social plans can be hard. Especially in the evenings. When I was pregnant, I read Bringing up Bebe and one of the big premises of the book is how the French feel strongly that babies and children can fit into your lives and that you shouldn't have to change and alter everything to accommodate them. I remember reading the book and thinking: YES! Life will be just as it was, except we'll have a small baby in tow. Obviously a few things would likely be different, but I didn't want to change our routines, change the way we cooked or approached time off together, or see our friends any less. Well of course I'm the fool. Or at the very least, I'm not as French as I thought I was. Today, we very much schedule things around Oliver's nap schedule and bedtime, but thankfully we have a lot of other friends with kids who get it. Friends who make homemade cookies, own ice cream businesses, and have really great taste in music. Friends who host the kind of occasion that warrants homemade hot fudge sauce and eating dessert first. Welcome: A New Site Design! It is a well known fact (in the Pacific Northwest, at least) that summer officially begins on July 5th. Fourth of July could very well be dicey, but generally the week after is smooth, sunny sailing. This year seems a bit different -- it's been mild and even overcast in the mornings, although my evening walks with Oliver are certainly warm enough to go sleeveless. We're drinking rosé. We splurged for some landscaping help and have a little plot of grass in our tiny backyard that's just calling for picnics and barefoot romps. We found an outdoor table and are in the market for some string lights. In short: sunny or not, we're doing this thing. 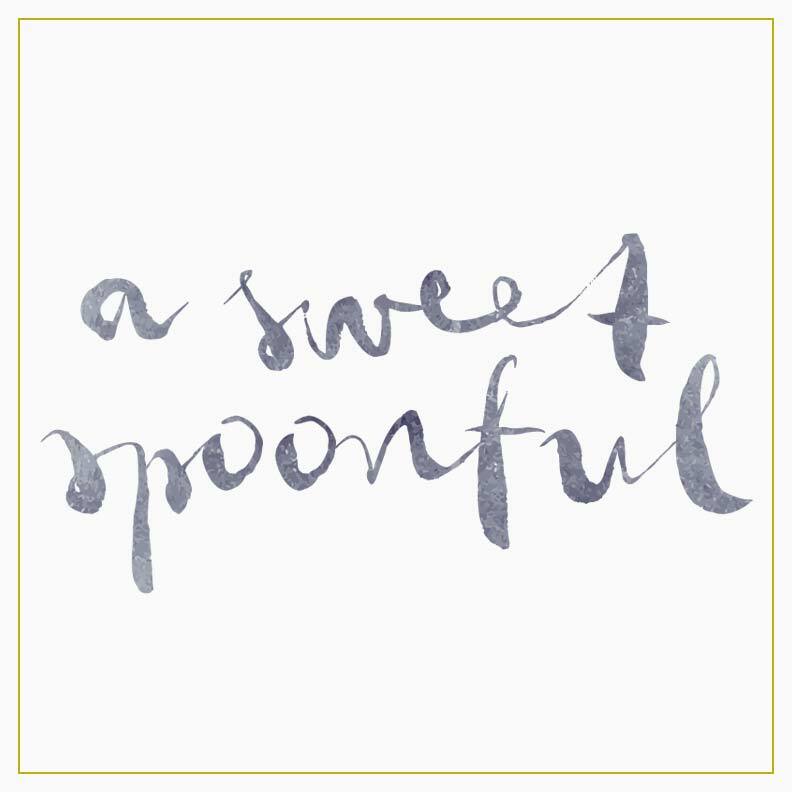 And I have a most simple and summery recipe to share with you today ... but first, I'm thrilled to introduce you to the new A Sweet Spoonful. This redesign has been months and months in the making and has a number of new features that I'm really excited about. Even more than tiny plots of grass and string lights (much more, in fact). I'd love to show you around. On Monday our little family of three is headed to the airport at 6 am to board our first with-baby cross-country trip. We'll be visiting Sam's family in New Jersey for a few days, then renting a car and driving over to meet up with my family at my mom's lake house in the Adirondacks. Sam's younger sister and her kids have yet to meet Oliver; my grandpa has yet to meet him, and Oliver has yet to take a dunk in a lake, see a firefly, or spend quality time with energetic dogs -- of which there will be three. A lot of firsts. This week my family has been madly texting, volunteering to make certain meals or sweets on assigned days while we're at the cabin and it got me thinking about really simple, effortless summer desserts -- in particular, ones that you can make while staying in a house with an unfamiliar kitchen and unfamiliar equipment and still do a pretty bang-up job. I think fruit crisp is just that thing. Somehow, in what seems to have been a blink of an eye, we have a six month old baby. In some ways I can't remember a time we didn't have an Oliver, and in other ways it's all a blur broken up by a few holidays (a Thanksgiving thanks to grocery store takeout, and our very first Christmas in Seattle), a few family visits, a one-day road trip to Portland, a birthday dinner out, a birthday cake, weekend drives to nowhere in particular, swimming at the pool with Oliver, weekly get-togethers with our parent's group, doctor's visits, hundreds of walks around the neighborhood, hundreds of cups of coffee, dozens (or more?) of scoops of ice cream. Most of the worrying about keeping a baby alive has made way for other concerns, and Oliver's need for constant stimulation or soothing walks and car rides has been traded for stretches of time playing with a new toy or checking out his surroundings. In truth, it's thanks to that tiny bit of baby independence that this humble, summery cake came to be in the first place. So we've all got an Oliver to thank for that. Or, really, we have a Yossi Arefi to thank, as it's from her beautiful new cookbook that I've bookmarked heavily and am eager to continue exploring. I received The Sprouted Kitchen Bowl + Spoon cookbook in the mail not long before we moved to our new house, and I remember lying in bed and bookmarking pages I was excited to try but also feeling overwhelmed with where to start: the truth is that this summer has been a relatively low-inspiration / low energy time in the kitchen for me. I'd been chalking it up to pregnancy but when I think back and if I'm honest with myself, my cooking style tends to be very easy and produce-driven during these warmer months. I rarely break out complicated recipes, instead relying on fresh tomatoes and corn or zucchini and homemade pesto to guide me. But last night I cracked open Sara's book and pulled out a few peaches I've had sitting on the counter, fearing their season may be nearing its end. 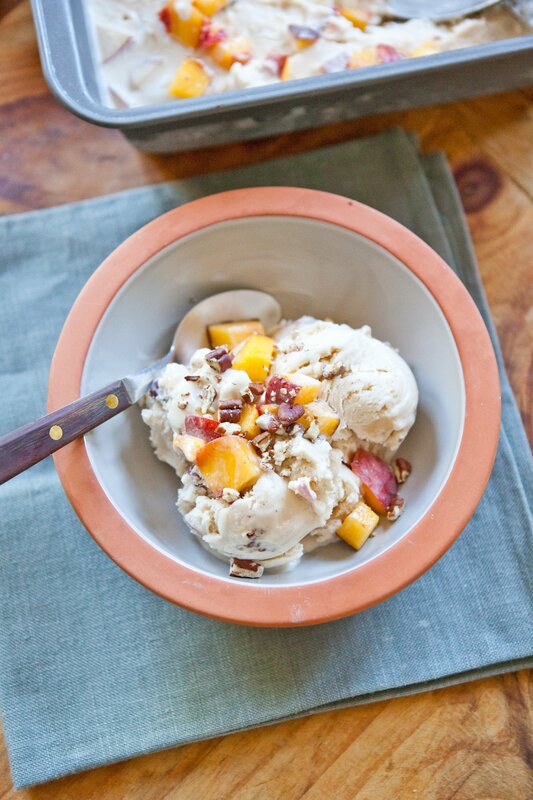 This morning as I was making coffee, I sliced up the peaches, toasted the pecans and churned away -- having a bite (or maybe two) before getting it into the freezer to firm up. You often hear how women begin to nest towards the end of pregnancy. This looks different for different people -- some staying up late at night finishing painting projects, others buying new furniture, stocking the freezer or spending time on the nursery. Next week I'll be entering the third trimester and I've been thinking a lot about the idea of nesting and of spending time at home. In truth, nesting isn't something that's new to me: I come from a family of nesters. My dad opened a furniture store the year I was born in Northern California and during my childhood it slowly grew to be a larger chain. He cared about the fixtures in our house, and would sit with me on our front stoop pointing out examples of good and bad taste -- mostly in cars that would drive by but I seem to recall this with passerbyers and their attire, too. I realize this probably sounds a bit pretentious or maybe even downright snooty, but we grew up pretty humbly in those days; it was more a matter of strong opinion than a reflection of, say, having more than anyone else on the block. Those opinions, of course, were contagious and today I care very much about the way our house is situated and how we spend our time at home (although I don't sit out on our stoop and talk to Sam about who I feel has good and bad taste on the block). My mom also cared a great deal about our home life: she always had fresh flowers in the kitchen or on the dining room table and insisted we all sit and eat dinner together each night. Even today, if you have a hard day or things feel a little off, she'll suggest fresh flowers and I've come to realize she's right: they really can fix many of life's very minor problems. In addition to bouquets, my mom was always an enthusiastic consumer of seasonal wreathes and colorful holiday decorations (and still is). She loves a good throw pillow and clean-burning taper candles. My people care about their surroundings. We just returned from my mom's cabin on Lake George in upstate New York where we often spend the 4th of July. As usual, each bedroom was packed with family members (this year the couch was even occupied for a night), and our days with reading, lounging on the dock, swimming a bit, maybe jogging down the road or playing tennis if you were feeling ambitious. We drank a notable amount of seltzer water; I managed to read three books and my mom threw us a family baby shower complete with balloons, chocolate cake and Mike's rhubarb bars. In previous years, my mom has planned most of the dinners and even some lunches, but for breakfast we'd all fend for ourselves. I'd often bake a pie or a batch of brownies in the afternoon and everyone would help out where they could, but she would largely do the shopping and brunt of the cooking. This year was different: having just moved from California to Vermont, my mom had a lot on her plate and sent out an email before the holiday weekend asking us all to chip in and help with the meals. Sam and I claimed Friday dinner: we grilled sausages and Sam made his famous deviled eggs. We cut up some unusually seedy watermelon that I found at the co-op in Burlington before we drove out to the lake, and I made a summery quinoa salad that I expected to be kind of epic. The trouble was that it wasn't. I overcooked the quinoa until it was kind of a congealed mush and everything just went downhill from there. 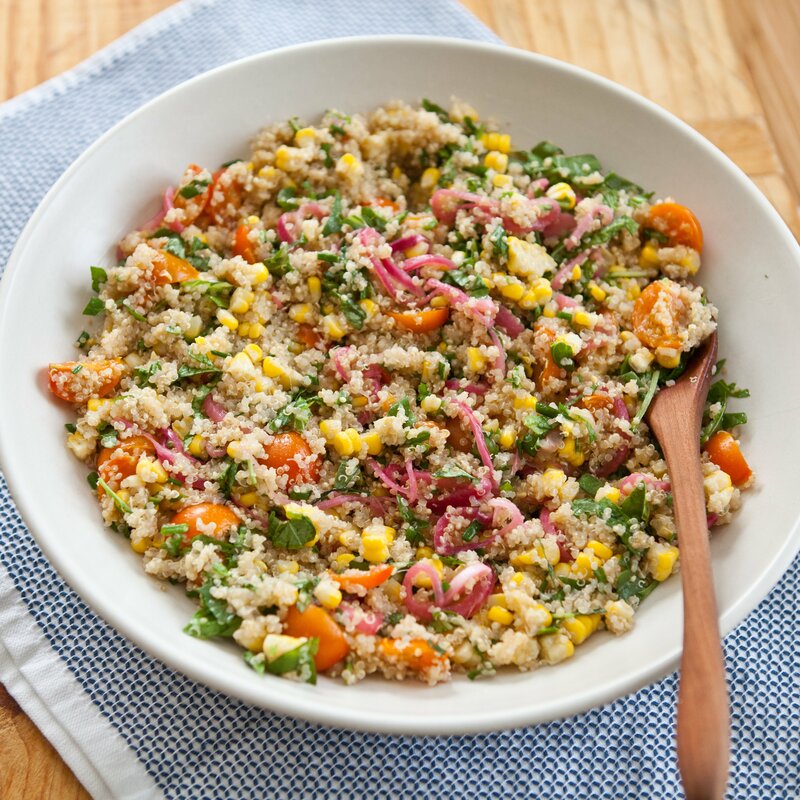 But I knew that the idea was strong -- to pack a whole grain salad with all the things of summer (corn! tomatoes! basil!) -- so when we got home to Seattle I tried again. And this time it's a winner. Hello from our guest bedroom where I have officially taken up refuge as our upstairs bedroom is stifling hot and my inexpensive drug store fan doesn't seem to be doing the trick. 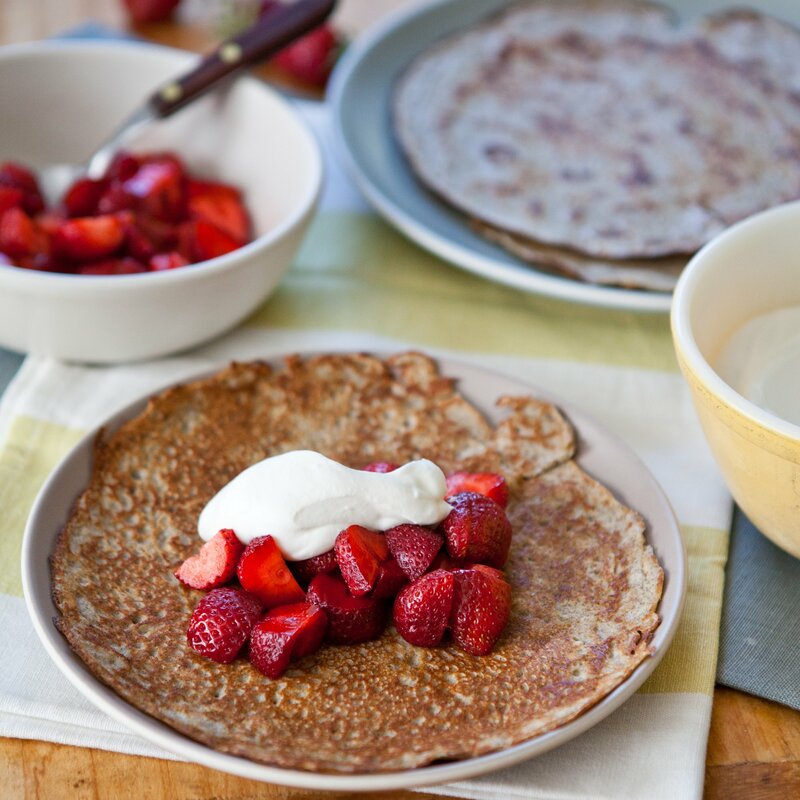 We're having a bit of a heat wave in Seattle, and Sam has been out of town all week so dinner has been a mellow affair, usually consisting of quesadillas or, on occasion, a big bowl of berries + whipped cream or popsicles. 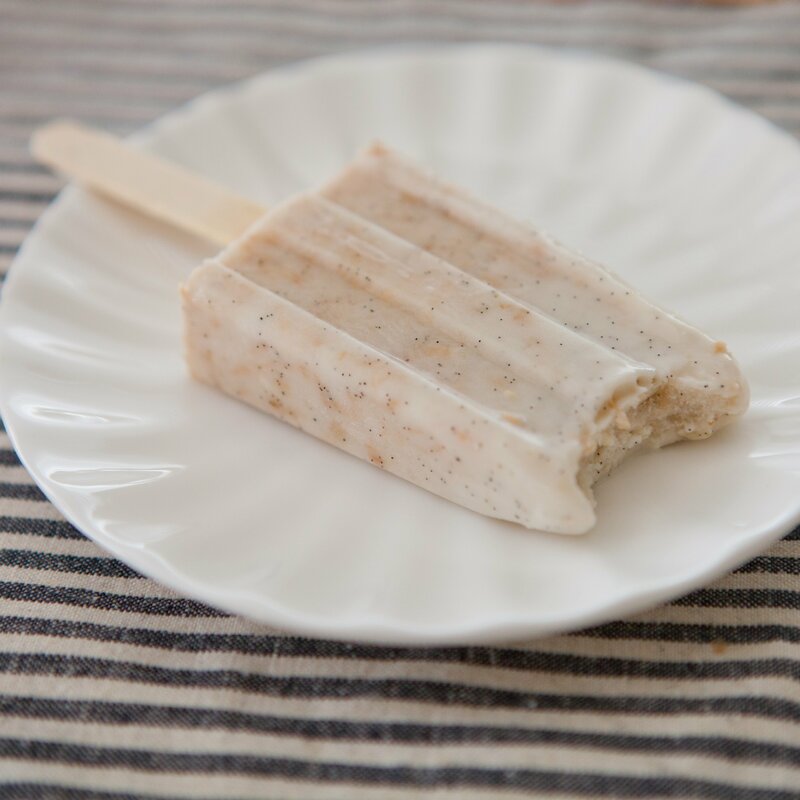 I finally just bought a popsicle mold and am not quite sure what took me so long, but I'm hooked and these coconut numbers were the first recipe I tried. The ingredient list seemed deceivingly simple, and I thought there's no way they could be as velvetty and luxurious as the ones I buy from our local co-op. But they are, and you can tailor them to fit your own taste in terms of sweetness and amount of toasted coconut. I'm not quite ready to share how many of these I've eaten this week, but I thought it was time I shared them with you. For many years, I've always made a summer to-do list. I usually set to work on it right at the beginning of June when the days feel long and ripe with possibility. The list often involves things like learning to bake sourdough bread or making homemade ricotta, doing an epic hike I'd read about in a local magazine, training for a marathon, or reading specific novels. It is always a pretty aspirational list, and I generally don't make much of a dent in it -- resulting in the guilty feeling come late August that I'd wasted too many lazy afternoons when I could've been baking sourdough or making ricotta or doing memorable, epic hikes. But this summer is going to be a bit different: there will be no list. We wait so long in Seattle for long stretches of sunny days, and now that it stays late until 9:30 (or later? ), I want to see more of our friends and find stretches of time to do not much of anything except catch up, tan our legs and eat farmers market berries. That's my list. This past week we've had quite a heat wave in Seattle. I've been getting into the bakery early in the mornings so as to avoid the afternoon heat + hot oven combination, and it turns out the upstairs of our new house is quite a little hot box. I bought some aggressive blinds and a new fan and am hoping both will help cool things down a bit. The wool blanket is in the linen closet for the season, and Sam's been making iced tea like it's his job. Summer has arrived! A few nights ago, the thought of actually doing much real cooking seemed a bit overwhelming, so I figured it was time to dig out the ice cream maker and get to work. I'd wanted to do something with the beautiful strawberries we have in the markets right now, but it seems every time I get a little pint it's gone before I have the chance. They are just so incredibly sweet, and it seems a shame to do anything other than eat them right out of the container, preferably while sitting on the Moroccan picnic blanket you brought back from honeymoon on the lawn in your new backyard trying not to stress out about the incredible, insurmountable number of weeds. So. Many. Weeds. 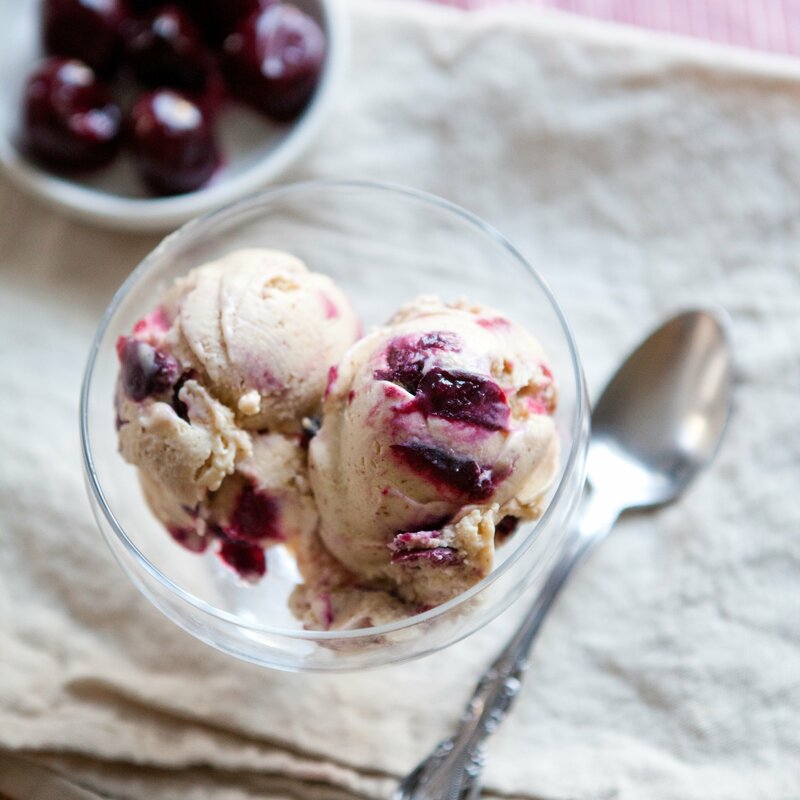 But cherries: somehow the bag of cherries made it safely through the weekend, so I set about to find a great cherry ice cream recipe. I had a weak moment on our honeymoon in Italy when I decided that I should be making gelato for a living. My enthusiasm for Italian gelato wasn't surprising to anyone. I'd done extensive research, made lists, had Sam map out cities in terms of where the best gelaterias were. I took notes and photos and hemmed and hawed over flavor choices: Sicilian Pistachio! Chestnut Honey! Sweet Cheese, Almond and Fig! In truth, on that particular trip, I cared far more about treats, sunshine, and cobblestone walks than I cared about famous landmarks or tourist attractions, often leaving the camera back at the hotel in favor of my small black notebook which housed detailed jottings on dessert discoveries in each city we visited. Our friends Matteo and Jessica happened to be in Naples on the one night we were there, and we all went out for pizza together followed by a long stroll around the city. At some point the conversation turned to gelato (as it's bound to) and Matteo brought up the famous school in Bologna where many renowned gelato artisans study. My wheels were spinning. Maybe we should visit Bologna. I should see this school! I should talk to these students! I could make Sicilian Pistachio; Chestnut Honey; and Sweet Cheese, Almond and Fig each and every day of our lives. Or at the very least, travel to Bologna to learn how and then come back to Seattle to take our Northwest city by storm. Well here we are six months later, back to reality, and the impetus to pack up my bags and head for Bologna has subsided for the time being ... but not the unwavering gusto to sample. That part will always be with me. 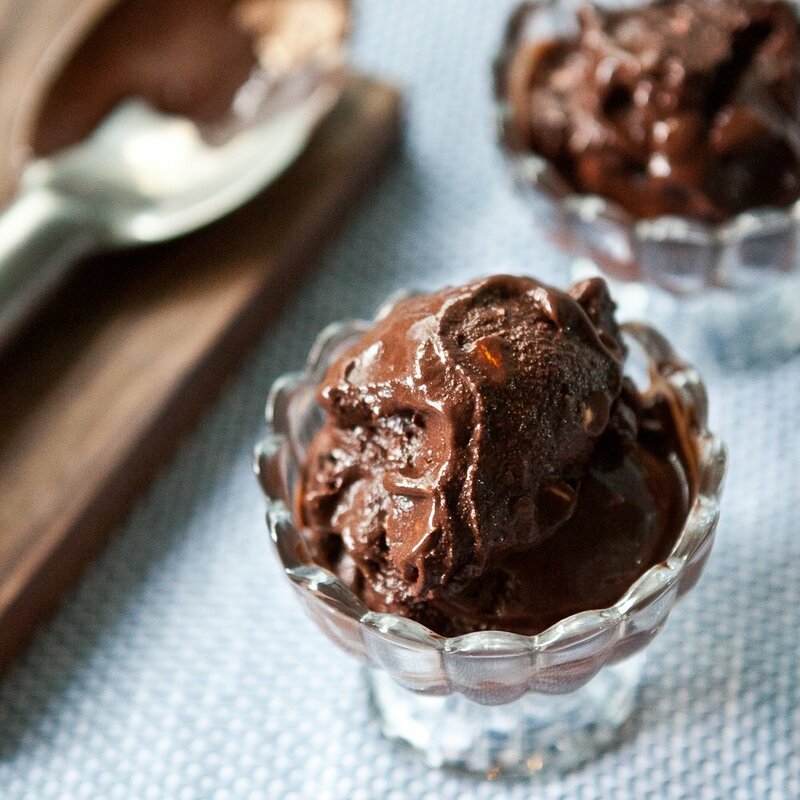 It's been awhile since I mixed up a batch of ice cream at home, but the other day a beautiful new cookbook landed on my doorstep and I flipped right to a recipe for dark chocolate sorbet with toasty, salty almonds. I didn't need much convincing. I call this time of the year, this month of September, the "bridge month." When I made pies for a living, I called them "bridge desserts," those slices of jammy sweets that'd have one foot definitively in fall and the other stubbornly in summer. That's always how I feel come September: eagerly anticipating the changing light of the new season, but also so very hesitant for the long days to creep away. And so, today, a warm weather recipe we can all nurse for a good month more: a silky, simple gazpacho that we had for lunch (and dinner) many times last month. And given our amazing tomatoes this year, I'm hoping for a few more rounds. I went many years without making gazpacho at home; I always find that it falls into one of three camps: the good, the bad, or the ugly. And most recipes I found in the past were firmly up for Ugliest Gazpacho of the Year Award -- which wouldn't matter if they were really delicious, but that was never the case. Now how could you mess up gazpacho, really? I find that the recipes that call for bread blended into the soup always end up murky and off-color, and just not at all appealing. 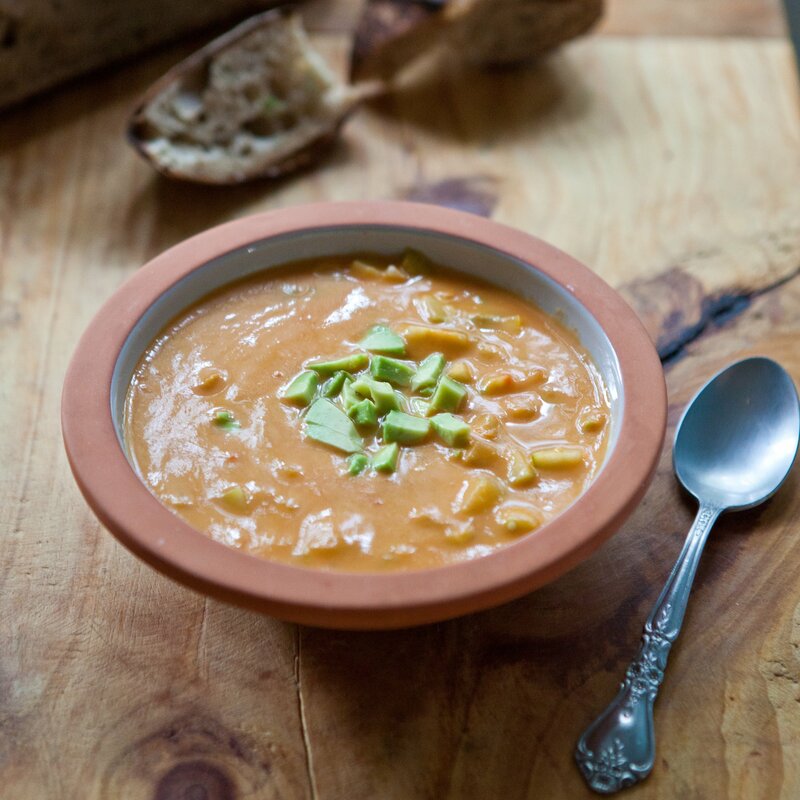 I don't particularly love a lot of onion blended into the soup itself, and I've seen a great many recipes that are heavily spiced with chile seasonings and it always baffles me as to why we can't just let the tomatoes shine. If you're buying ripe, in season tomatoes you need little else. In the introduction to the Summer chapter of my cookbook Whole Grain Mornings, I talked about my approach to summer cooking -- how it should be easy and effortless. How ironic it is that with all of the beautiful produce and fruit in the markets, summer meals are usually the ones that feel the most haphazard and thrown together. I used to get down on myself about this, wondering why I never took advantage of all the beautiful squashes and tomatoes and fresh herbs, making more complex meals or interesting new recipes. Instead I often rely on simple dinners of sliced tomatoes, cheese and good bread or big leafy salads with homemade buttermilk dressing. 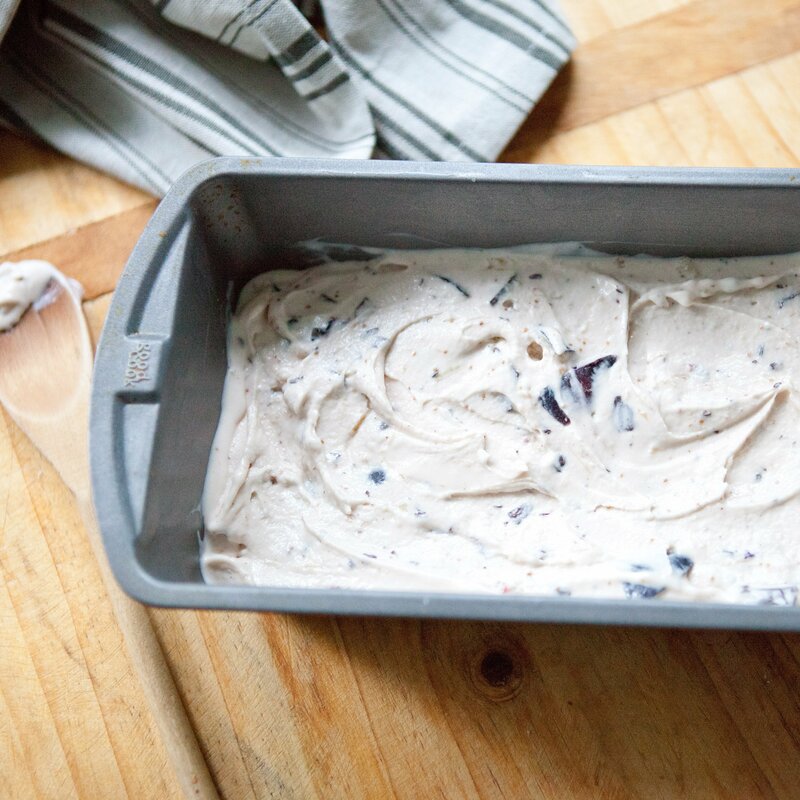 Dessert is often a simple bowl of berries or a scoop (or two) of homemade ice cream. I think moving to Seattle a few years ago changed the way I think about summer cooking. I'm no longer hard on myself or set any major expectations for kitchen goals or recipes to tackle. When it's light until 9 or 10 p.m. and you happen to have the warmest June on record, the picnic table in the backyard is too inviting to pass up and standing at the stove can ... wait. Plus, what better way to celebrate all of the beautiful summer produce than doing very little to it and letting it speak for itself? That's what this Summer Squash Pasta with Ricotta Pesto and Tomatoes is all about: simple, delicious, summer "cooking." 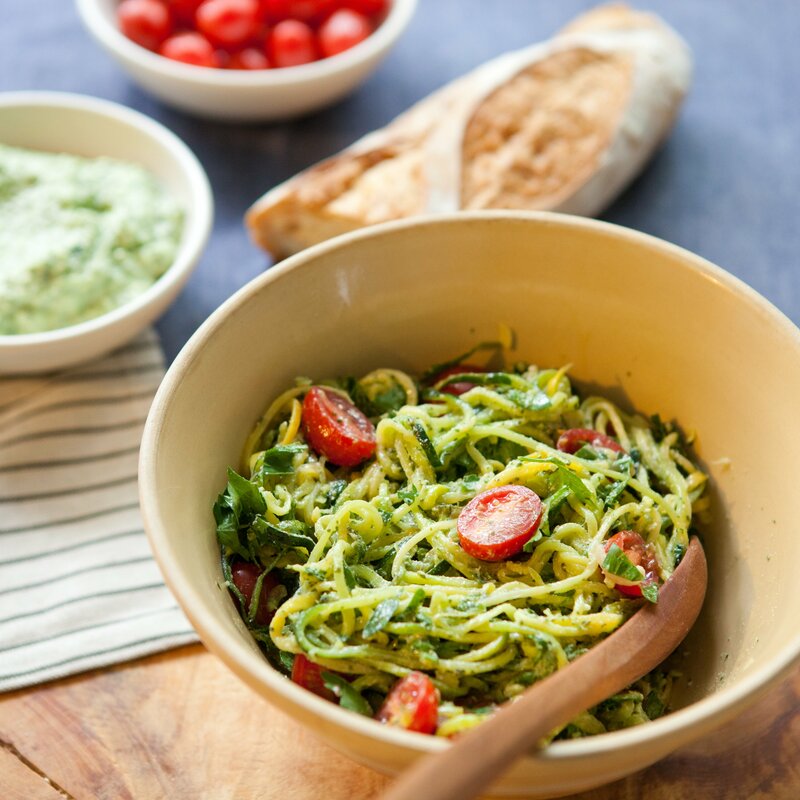 We've eaten this twice a week now for the past few weeks, mixing up the add-ins and the type of pesto -- some nights making a cashew pesto, other nights experimenting with a kale and arugula version. This recipe today uses a creamy, summer-worthy ricotta pesto and fresh little grape tomatoes. It doesn't require any cooking and, this past week, we discovered on a rather impromptu trip to Orcas Island that it's easy to make on the road, too. And even more satisfying, perhaps. One of the things I most love about this blog is the way I can look back through the seasons and years and glean a sense of what that time felt like for me, judging by the food I was eating, the things I was baking, the stories I was telling. If there is just one recipe that will speak to the way we ate this summer, this is it: We can't get enough. A triple berry summer crisp made with oats, quinoa flakes and hazelnuts. Summer in a skillet. My good friend Keena was working in India for the last few months and just returned to Seattle, eager to experience as much Pacific Northwest summer as possible in September. I'm with her on this one: It just so happens that towards the end of this month, the farmers markets I've been doing will also come to an end, so things seem like they're both simultaneously gearing up (hike! picnic! beach!) and wrapping up at the same time as I also feel a sense of wanting to cram in as much as I can before the days start getting noticeably shorter. 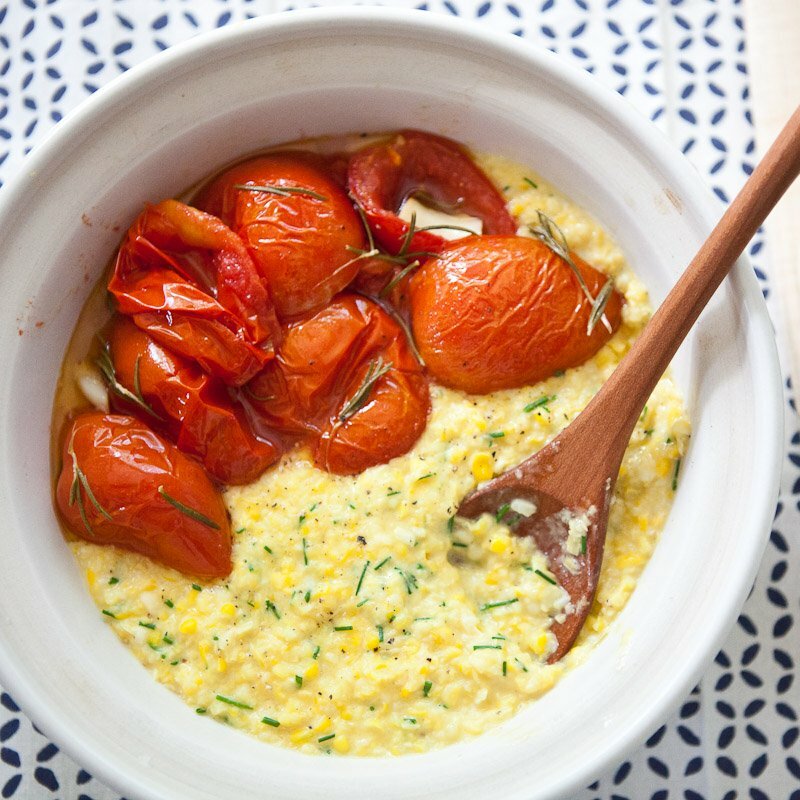 And truly: there's no better recipe to commemorate such efforts than these fresh corn grits with oil-poached summer tomatoes. I had a different kind of post planned for today. I'd wanted to talk to you about measuring your own success and how the markers of success can be tricky. I can imagine that post, and I think you would've liked it. Heck, maybe I'll still write it. But this afternoon I worked the farmers market and witnessed a few things too good not to mention. The Marge Granola booth sits right next to a woman who sells beautiful flowers. In my weeks working next to her, I've learned a lot. I know that red dahlias are the most popular. I also know that they last four days. I know what wild amaranth looks like in all its fluffy stalkiness, and I can pick out the best lily in a bunch. I'm often gifted a few stems at the end of the day, and have so loved placing them all around the house. Each week a new color.